Estate Planning can seem like a daunting task and many people I run into tell me they don’t know where to begin. Interestingly, like many things in life, getting started is half the battle. Because it is so important to have an estate plan in place, I prepared this guide to help you get started. If you’d like to educate yourself on estate planning basics and some advanced estate planning topics, reviewing my blog is where you want to start. By clicking here, you will appear at the top of my blog page. From there, there is a search feature where you can type any topic you’d like to learn more about. Some of my more popular posts include 5 celebrities with amazing estate planning mistakes, 5 great estate planning New Year’s Resolutions, 7 tips when deciding who to work with on your estate plan, and 7 movies with unbelievable scenes about estate planning. The blog is a great resource so be sure to check it out. My office provides a monthly newsletter to my clients. In this newsletter, I update my clients to changes in estate planning laws, interesting articles I post in my blog, and information about our firm, such as when I was featured in U.S. News and World Report. You can subscribe to this Newsletter for free by clicking here. Don’t worry, you can unsubscribe at any time with one click. But, you can learn about important estate planning issues in the Newsletter and reading the blog and subscribing to the Newsletter is a great estate planning beginner’s guide. Remember, this isn’t a complete guide to estate planning. It’s a beginner’s guide. It should be used in conjunction with an experienced estate planning attorney. When it comes to estate planning, one of the first things you should do is define your estate planning goals. In other words, what is that you want to accomplish? Are you planning because you have minor children and you want to choose who raises them if something were to happen to you or your spouse? Do you want to protect a child with special needs? Concerned with what will happen to your business if something were to happen to you? Are you facing estate taxes if you were to pass away? Is there a charity you’d like to support upon your passing? Do you want to avoid the months and sometimes years it takes to go through the probate process? Are you in an industry where you could be subject to a lawsuit and you want to make sure you save something for your children by doing some asset protection planning? There are many reasons why you want to start getting your affairs in order. Knowing what those reasons are is essential to having a good estate plan. These are just some of the things you might have. An experienced estate planning attorney can assist you in making sure you have everything listed and brainstorm with you to make sure there isn’t anything you might not have thought of yourself. Who is going to get your things? To summarize the first steps in this beginner’s guide, you want to define your estate planning goals, make a list of your assets, and determine who will be getting your assets once you pass away. After you’ve done this, the next step is determine how you want to get your assets to whomever or wherever they are to go. For most people, this means deciding between a Last Will and Testament and a Trust. A Last Will and Testament is a written explanation of how you want your assets distributed upon your passing. Notice that it must be written. Some states allow oral wills, but Georgia is not one of those states. Additionally, the will must be witnessed. In Georgia, this means two people must watch you sign your Last Will and Testament. It will also allow you to name a Guardian for a minor child if you need to. (The Last Will and Testament is the only way in Georgia to name a Guardian for your minor children). There are other types of estate planning vehicles, such as a Trust, which we will discuss later, but know that a Last Will and Testament is one of the most basic estate plans you can create. Therefore, it is the first thing to consider in this beginner’s guide. Do you need a Last Will and Testament? Probably. No matter how rich or poor, young or old, everyone can benefit from a Last Will and Testament. These days, many people are turning to Trusts as their primary estate planning vehicle. There are many reasons for that. For some people, they simply want to make their estate settlement simple. The Last Will and Testament does not avoid the probate process. Instead, it takes you through it. This can be a months-long, sometimes years-long, process of distributing your assets when you pass away. Trusts can avoid that lengthy (and costly) process. A Trust accomplishes this by removing your assets from your probate estate. In other words, you create the Trust and then you place your assets into the Trust. Because the assets aren’t in your name any longer, they won’t need to go through the probate process. This is a simplified explanation of how it works because there are some assets that won’t need to be put into the Trust (and there are some assets that you can’t put into the Trust). Discuss this with an experienced estate planning attorney and they can describe this process in much more detail or you review some of the materials from our website. Again, this is just a small list of some of the common types of Trusts available to people interested in estate planning. Another benefit to a Trust over a Last Will and Testament is the privacy aspect. While the Will gets filed at the Courthouse (and becomes public record), the Trust is a private document. Many of my clients prefer that their estate planning desires and wishes are not filed at the Courthouse. While everyone should at least have a Last Will and Testament, our Marietta Estate Planning Attorney Beginner’s Guide would not be complete without discussing Trusts. Other items to discuss in this beginner’s guide are disability documents. You probably already know what these are or are familiar with them. These include your financial power of attorney and an Advance Directive for Health Care. These important documents allow a person, perhaps a family member or trusted friend, to pay bills on your behalf, access your medical records, talk to the doctor for you and make other important decisions for you if you’re unable to make them yourself. If you ever get to a point where you can’t make those decisions yourself, your family will have to sue you to have you be declared incompetent. Once you are declared incompetent, the Judge will appoint a Guardian for you who will then make those important decisions. My experience has been this is often who you would have chosen anyway, so go ahead and get these simple and basic documents. Let’s summarize where we are so far with this beginner’s guide. First, you want to review the articles in our blog. It contains a ton of estate planning information. Second, subscribe to our newsletter. This way, you can stay up-to-date with important estate planning documents. Third, consider purchasing my book, Estate Planning for the Modern Family. 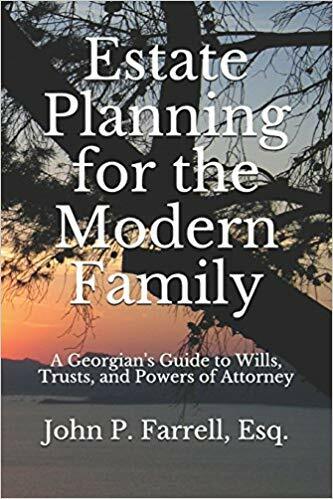 It goes into depth on a number of estate planning issues and is a step-by-step guide. Next, consider your estate planning goals. Think about what you want to accomplish with your estate plan. Then, make a list of your assets. This may take a little time, but it’s all part of the process. Next, list who you want to get your assets upon your passing. Often, this is your family, but it can also include a charity and even your pets. Additionally, if you don’t already have one, consider getting a Last Will and Testament. Remember, everyone can benefit from one of these. If you value privacy or want to make your estate settlement simple or have property in multiple states, consider creating a Trust. Many people are turning to a Trust as their primary estate planning vehicle these days. Finally, create a financial power of attorney and an Advance Directive for Health Care. Now that you’ve been through our Marietta Estate Planning Attorney Beginner’s Guide and the task still seems daunting, let me recommend you reach out to us for assistance. We specialize in giving you peace of mind that your affairs are in order. From our office off of Alexander Street near the Marietta Square, we offer free consultations to help you with your estate planning needs.